It is no secret that I love a good pop punk record. Sure, even the term pop punk has been slighted over the years and so many people just disregard the entire genre. There are a lot of bad pop punk bands, so I can sort of understand where people are coming from, but there's also some truly great bands cranking out pop punk records. Wringer is one of those bands. If you take the punchy attitude of Dillinger Four and mash it up with some of the early Lookout records catalog, you'd probably come up with Wringer. While they don't really lean towards the Leatherface end of the spectrum like D4 does, they have the same sort of grab-you-by-the-throat energy. Their songs are a bit more straight forward and when the band comes across a hook, they just run with it. The first 100 were on red vinyl and according to the label's website, it is possible they have a few available, but you may want to check with them. Wringer also has a split 7" out in the world with a band called Trapper Keeper. I'm going to need to add that to the collection at some point as well. 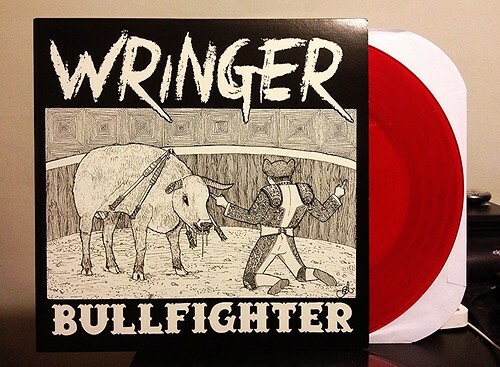 If it's even half as good as Bullfighter, it will be a hell of a 7".